The American team contesting the women’s team pursuit qualified in second of 10 teams in front of a packed house at the velodrome in London on Friday. The U.S. riders registered an unofficial American record time of 3:19.406 in the event that is new to the Olympic track program. The American contingent of Dotsie Bausch (Irvine, Calif./OUCH Pro Cycling), Sarah Hammer (Temecula, Calif./OUCH Pro Cycling) and Jennie Reed (Seattle, Wash./OUCH Pro Cycling) completed the three-kilometer event 3.8 seconds off Great Britian’s top qualifying and new world record time of 3:15.669. The Australian squad qualified third, less than half a second off the American time and Canada was fourth just behind the Australians. The U.S. trio bettered the previous national record time of 3:19.569, established on May 12, 2010, by Hammer, Bausch and Lauren Tamayo (Asheville, N.C./Exergy TWENTY12) at the Pan American Games in Aguascalientes, Mexico. The Americans will face the Australian entry, which qualified third, tomorrow just after 4 p.m. BST. After posting a new world-record time, Great Britain will face off against fourth-place qualifier Canada. The finals are scheduled for 5:42 p.m. BST on Saturday. Only the top four teams are eligible to win the gold and silver medals. The top eight contingents can win the bronze medal. The winners of the matchups pitting the top four teams will advance to race for the gold medal. Aside from those two winners, the teams with the remaining top two times will faceoff for the bronze medal. 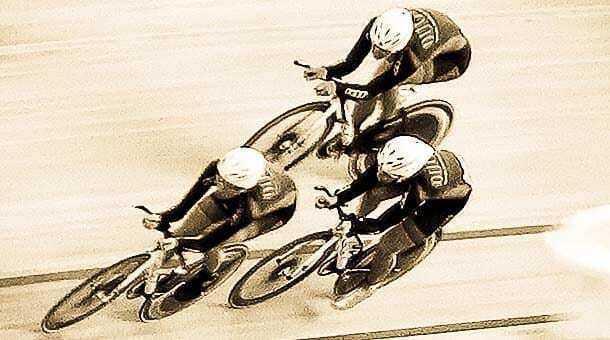 The track cycling continues Saturday for USA Cycling beginning with the men’s sprint qualifying at 10 a.m. local London time. The men’s omnium begins at 10:30 a.m. with the time trial, points and elimination races and the women’s team pursuit resumes with the first round of competition. The track events will be streamed live on www.nbcolympics.com with television coverage slated on your local NBC station. For more information on cycling at the Olympic Games, visit www.usacycling.org/olympics.